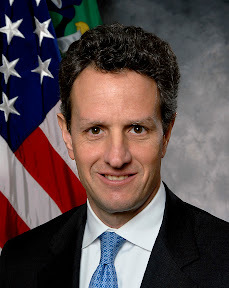 Treasury Secretary Timothy Geithner has to be pleased with the buyback of $2 billion in GM stock. Image from Wikimedia Commons. General Motors has announced that it will be buying a significant portion of shares back from the Treasury. As part of the auto bailout, GM had to turn over a number of preferred shares to the United States Treasury. Earlier this year, GM announced it was getting back to fiscal health, and the company was planning an Initial Public Offering of stock. The Treasury will gradually release its shares. Currently, the U.S. government technically has a majority ownership stake in General Motors. Over the past year, General Motors has returned to a more fiscally stable and potentially sustainable business plan and has begun paying back its creditors. A few months ago, General Motors announced that it would hold an initial public offering, or IPO, of its shares by the end of 2010. It was just announced that General Motors, according to the New York Times, would be making another payment on its debt to the government, in the form of buying back $2.1 billion in stock. The stock that people purchase on the stock market is usually common stock, but the government holds preferred stock in GM. Preferred stock is more like a loan from an investor, in that it pays monthly dividends. The Treasury has been receiving 9 percent, or $700 million, in interest payments on the $50 billion auto bailout that GM received, according to CNN. General Motors has so far paid back just less than $7 billion, and the bulk of the loans will be repaid as the Treasury sells its stake in GM over time. The government’s shares will not be sold all at once in the GM IPO but rather will have regular releases so as to not drive the price down. It has been calculated that for the GM IPO to technically turn a profit for the government, at least $67 billion will have to be sold. It is anticipated that GM stock could go for anywhere from $63 billion to $90 billion when the IPO is made.